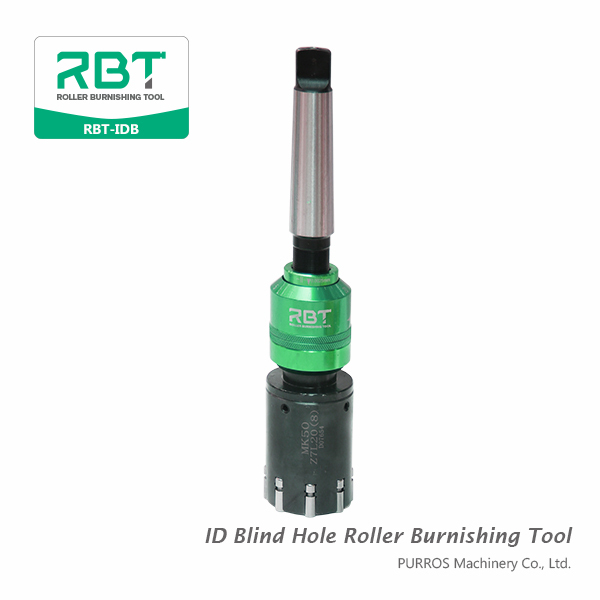 What are the problems to be paid attention to in using RBT deep hole roller burnishing tool? What is a deep hole? In most cases, L/d is greater than or equal to 100. Such as cylinder bore, shaft axial oil hole, hollow main shaft hole and hydraulic valve hole and so on. Some of these holes require high machining accuracy and surface quality, and some of the processed materials have poor machinability. 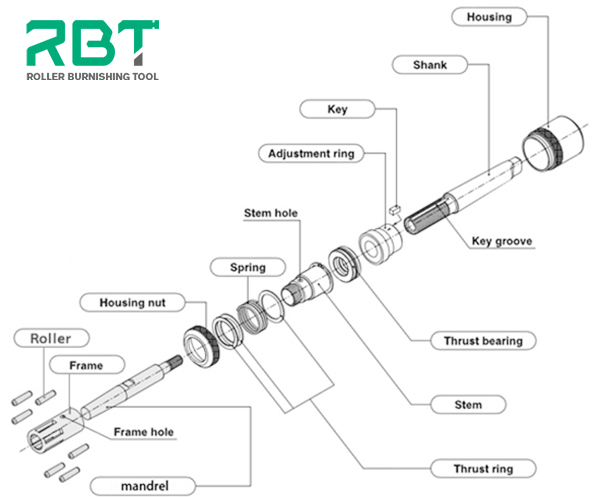 If the cutter body is long, also there is high requirement for radial runout of clamping tool. For cooling system, there is an inner-cooling device in the tool, so there are high requirements for equipment. 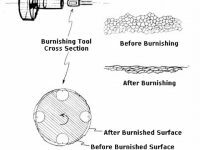 Problems that should be paid attention to when roller burnishing tool is used for deep hole processing. Process dosage during rolling: Vc=20 ~ 100m/min, f=0.2 ~ 0.5mm/r, and rolling surplus is 0.05 ~ 0.15mm. Lubricant is mechanical oil. Pay attention to the problem: the workpiece must be cleaned before rolling; Interference should be flexibly mastered, that is, the workpiece material has high hardness, thin wall, low original surface roughness, and its interference is smaller. The opposite is bigger. 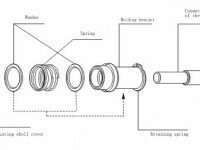 What’s the processing principle of roller burnishing tools? 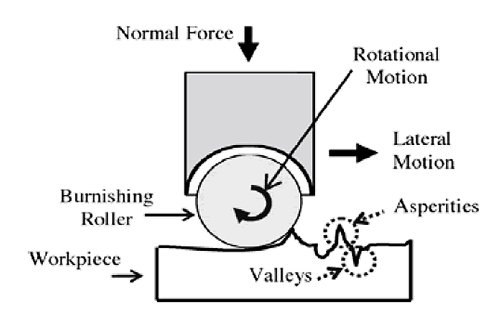 Schematic representation of burnishing process. The roller burnishing tools works like a road roller flattening the uneven road. Roller burnishing tool is to use very smooth roller rolling by processing the surface of the metal, the workpiece performance high extrusion convex parts to dips, so that the machining surface smooth as a mirror effect, this is a kind of plastic processing. The surface roughness of workpiece is up from Ry1.6-3.2 um to Ry0.1-0.2 um, and improve the processing surface hardness, wear resistance, corrosion resistance, sealing, etc., to eliminate early wear, these have the advantage of machining cannot be replaced. The rolling tool has a fine tuning device. The adjustment coefficient of each small grid is 0.0025mm, and the total adjustment range is 0.3mm-0.4mm. Therefore, the precision of the processed dimension is also improved accordingly. 1. Measuring the burnishing tool’s diameter with micrometer. 2. Push the calibrated set to the handle and rotate it at the same time, adjust the diameter of the tool, reduce the left rotation, and increase the right rotation, each scale value is 0.0025mm. 3. When the diameter is adjusted, release the aluminum shell and automatically lock the diameter. 4. When machining blind holes and step holes, the bottom is about 0.5mm-1.0mm cannot be machined. The needle can lightly touch the bottom of the hole. We are roller burnishing tools suppliers. 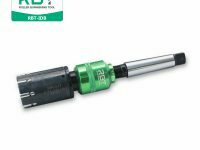 RBT roller burnishing tools are suitable for common drilling machine, lathe, boring machine and machining center. The clamping forms of tools include: straight shank and Morse taper shank. It can also be made according to customer needs. 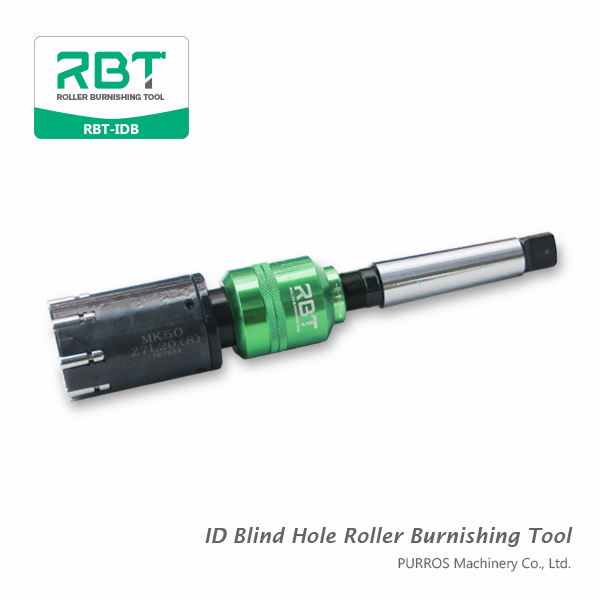 Our Roller Burnishing Tools are made using high-grade raw material, at the vendors’ end. Our product range is highly demanded in the market for its hassle-free work performance the users’ premises. 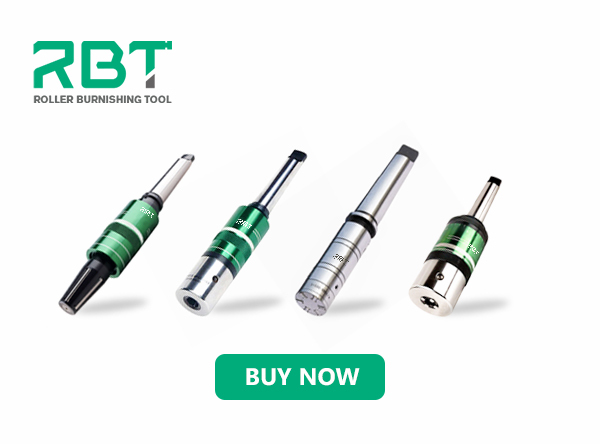 If you do not know how to choose the model of the burnishing tools, you can contact us. We have professional customer service staff to help you find the most suitable product.